Centers-of-Gravity Calculator is an online supply chain network design tool that determines Centers-of-Gravity warehouse locations that come with minimal outbound and inbound transport costs. * Outcomes are displayed on a map that you can download. It offers extensive functionality. You can set up fixed warehouse locations, limit movement ranges, limit warehouse capacities, assign customers and suppliers to warehouses, and group customers. It connects supply to demand, optionally via two echelons, and displays cost sensitivity areas. Multinationals around the world have been using Centers-of-Gravity Calculator for years. * In fact, this calculator minimizes the sum of weighted as-the-crow-flies-distances. Its core algorithms are described in full detail, below. It runs much faster than Excel Solver (test 2018) and Llamasoft (test 2017), producing equal results. Stelling Consulting advises to use Google Chrome. 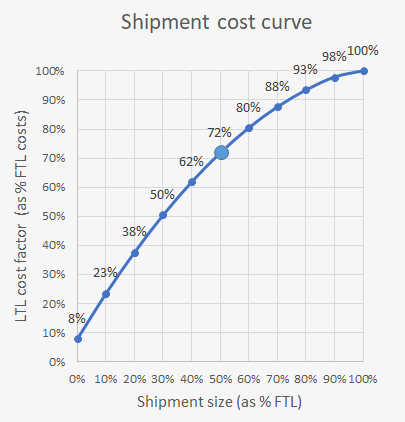 The calculation is based on a cost curve as shown in the chart. About Save and Load: your data and settings will be saved in local browser memory - not on a server - and only if you press the button. You can reload if logged in and continue working on your project. → Save an Load are not functional in demo mode. See also detailed output tables further below. This demo version is fully functional, except for being able to enter your own supply chain data. Demo data, as shown below, has been loaded. Login or create a paid account via the top of this page, if you want to run with your own supply chain data. The case contains 590 customer locations throughout Europe. The demo starts with five Centers-of-Gravity. There are two predefined warehouses, one in the UK (Birmingham, cannot move) and one in Spain (Madrid, can move within a 200km range). Both locations can move freely if "predefined warehouse locations" is unchecked. They also have certain capacities, which are ignored if you uncheck "capacity limits". Customers in UK/Ireland have been assigned to the Birmingham warehouse, customers in Spain/Portugal to the Madrid warehouse. These assignments are ignored if you uncheck "fixed customer-warehouse assignments". All customers have a group set equal to their country code (ISO Alpha-2 ) effectively meaning all customers of a country are assigned to a single warehouse only (no country is being delivered from multiple warehouses), unless you uncheck "customer groups". All supply in the demo case comes from harbour Rotterdam, The Netherlands, and from Bologna, Italy, so Centers-of-Gravity will tend to move into those directions. The higher the supplier transport costs ratio, the more they tend towards Rotterdam or Bologna. Unless you uncheck "supply", in which case the Centers-of-Gravity are based on demand only. The more freedom - initially zero in the demo case - the more solutions may start tot differ from each other, as depicted in the run score chart. You add more freedom, by simply unchecking constraints. Of course, you can also adjust the number of warehouses. Though not mandatory, it is advised to express quantities as rounded numbers without thousands or decimal separators, and to filter out all records with a zero quantity beforehand. Use decimal point - not decimal comma - as decimal separator. Any commas in your data will be removed automatically. You can enter your data semicolon or tab separated. Tab separated data will be converted to semicolon separated data automatically. Warehouse_ID: free format, e.g. "Birmingham". To assign a customer permanently to a warehouse enter the Warehouse_ID of a predefined warehouse location. Group: free format, e.g. "UK". All customers with the same Group will be assigned to the same warehouse that comes with the lowest sum of weighted distance for this group of customers. If you specify Warehouse_ID, the customer will be assigned to that warehouse, regardless Group. Leave Warehouse_ID empty if you want to specify Group only. Warehouse_ID: free format, e.g. "Birmingham". To assign a supplier permanently to a warehouse enter the Warehouse_ID of a predefined warehouse location. It also means this supplier will not assign pro rata customer demand to all warehouses - it overrules that option for this particular supplier. You can predefine warehouse locations as fixed locations or as seed locations. Fixed location: set Move_limit to 0 (km). A fixed location cannot move. Seed location: set Move_limit > 0 (km). A seed location may move within its Move_limit (around its specified coordinates). Give each warehouse a Warehouse_ID and use this Warehouse_ID in the customer table and/or supplier table if you want to assign customers and/or suppliers to a warehouse. Warehouse capacity: limits the amount of demand that can be assigned to a warehouse. Adhering to capacity constraints may ignore customer groupings. Fast greedy algorithm implemented. Combining both options you can replicate your current network structure, and compare costs of the current structure to costs of alternative structures. Or determine the optimal location of a warehouse given its current customers. If you already know you will operate a single warehouse in UK to deliver UK customers only, split your data into 'UK data' and 'mainland Europe data' and run the model for both sets separately. Outcomes may vary, due to initial random locations. Run several times to check if a solution reappears and/or to see alternatives. No restrictions apply in the 'warehouse-moving-process': warehouses may end up in the middle of the sea. Demand Centers-of-Gravity are those locations that minimize the sum of weighted distances. Weighted distance is the as-the-crow-flies-distance from warehouse to customer multiplied by demand. E.g. if customer A has a demand of 10 and is located 25 km from its warehouse the weighted distance is 250 km. Summing over all customers gives the sum of weighted distances as an indicator for transport costs. It is a relative figure, not an absolute cost figure. The Centers-of-Gravity algorithm minimizes its value by moving warehouses. Implicit assumption: transport cost = rate/km × distance. So minimal transport kilometers come with minimal transport costs (and minimal Green House Gas emissions). This assumption is partly valid. E.g. parcel rates are distance independent within a country, FTL pallet rate/km is lower than LTL pallet rate (you may adjust demands for this in your input), macro-economic imbalance cause direction-dependent rates, et cetera. The sum of weighted distances belonging to the current warehouse setup and customer assignments can be compared to the sum of weighted distances of alternative setups. The ratio between those indicators combined with a current customer transport costs figure will provide a rough estimation of how much can be saved on customer transport by changing the supply chain network structure. Customer transportation costs are only a (substantial) part of total costs. The optimal number of warehouses and locations are driven by many quantitative and qualitative factors: (future) transport and warehouse rates, tax, demand, lead time requirements, inventories, supply chain risk, law (e.g. in some European countries the warehouse of medical supplies has to be located in the customer country itself). Nevertheless, it is standard practice to run a Centers-of-Gravity-analysis to get an indication how many and what warehouse locations to consider, when doing a supply chain network design project. Customer A has a demand of 10 and customer B a demand of 1, where is the CoG? Somewhere on line A-B, closer to A? Well, customer A pulls 10 times harder than customer B. If moved towards A over a distance d the sum of weighted distances goal value lowers (10 x d) – (1 x d). So, the CoG is right on top of customer A, not somewhere in between A and B. Though the goal value is sum of weighted distances, distances are irrelevant when figuring out in what direction to move the CoG. The overall demand force is leading. In the example it has a length of 9 and points towards customer A. The overall demand force points the right direction, but does not tell how far to move the CoG. Repeat steps 2 and 3 until the goal value does not improve anymore. Di is the distance between customer i and the warehouse this customer is assigned to. This inital Center-of-Gravity is often presented as optimal, but this is not true! Imagine there are only two customers, customer A with demand 10 at position (0 , 0) and B with demand 1 at position (100 , 0). If the Center-of-Gravity moves a distance d towards customer A the goal value improves 10 × d (closer to A) − 1 × d (further from B) = 9 × d. So the optimal position is on top of customer A, not at (9.09 , 0) as given by the formula. The optimal Center-of-Gravity has a goal value of (0×10+100×1) = 100, whereas the initial Center-of-Gravity at (9.09 , 0) has a much higher value of (9.09×10+90.91×1)=182, so 82% higher costs. In realistic situations with multiple customers, the relative difference will be much smaller - more like 5% - as can be seen in the visual simulation further below. Though the goal function contains distances, these are irrelevant when determining the optimal Center-of-Gravity. FY = force in y-direction = ∑i (Qi. (Y_cog − Yi)/Di) on a flat surface, or ∑i (Qi.sinus(anglei)) in general. Moving the warehouse in the x and y direction of the force - first normalized by dividing it by its own length - lowers the goal value. 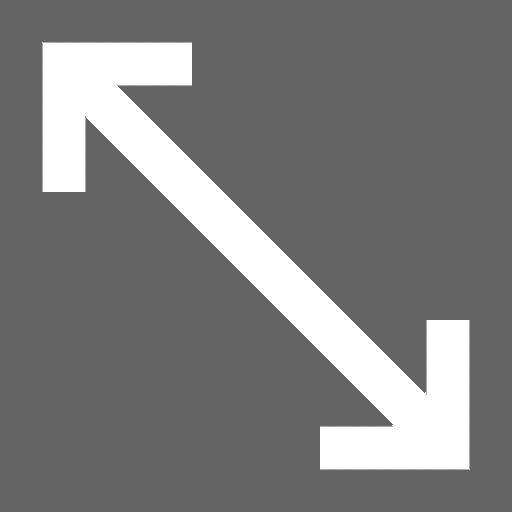 The distance to move in that direction - initiated at a large value - is halved each time the new position would result in a worse goal value (a case of 'overtargetting'). Step 3: calculate the goal value. If it increases, then move back to the previous position, and update step_distance to step_distance/2. Repeat steps 2 and 3 until step_distance has become sufficiently small (e.g. 1 meter - in most cases the force will then be close to zero). This algorithm resembles the gradient descent method with force replacing the gradient. The quality of the algorithms of this Centers-of-Gravity Calculator equals that of Excel Solver and Llamasoft.